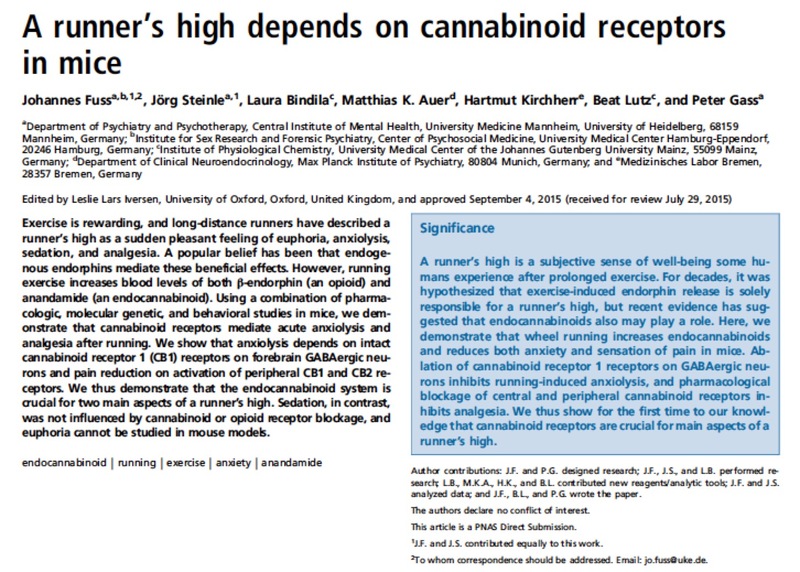 I recently read a scientific article in Proceedings of the National Academy of Sciences (PNAS) on the biochemical basis of the "runner's high", published by a group of researchers in Germany. 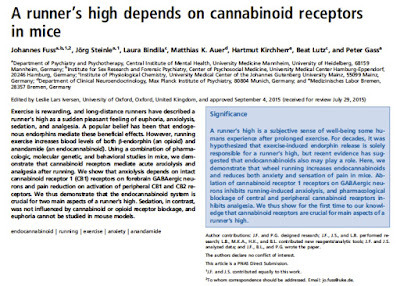 The runner's high has been described as a "sudden pleasant feeling of euphoria, anxiolysis, sedation, and analgesia." A few decades ago, scientists discovered that physical exercise stimulated the pituitary gland to produce peptide molecules named "endorphins", with beta-endorphin the best studied of these peptides. Beta-endorphin apparently triggers opioid receptors, dulling the sensation of pain. For years, beta-endorphin was thought to be the causative agent for the "runner's high". The problem with this idea is that the structure of beta-endorphin is much too large to cross the blood-brain barrier (31 amino acids, molecular weight over 3000 g/mol). The blood-brain barrier allows small molecules (glucose, ethanol, caffeine, nicotine) to enter the brain, but protects the brain against virtually all substances with molecular weight greater than 500 g/mol. 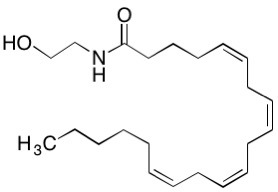 Chemical structure of anandamide. The next time that you hear someone talk about feeling the endorphins, please do correct him/her, because he/she is actually high on anandamide. 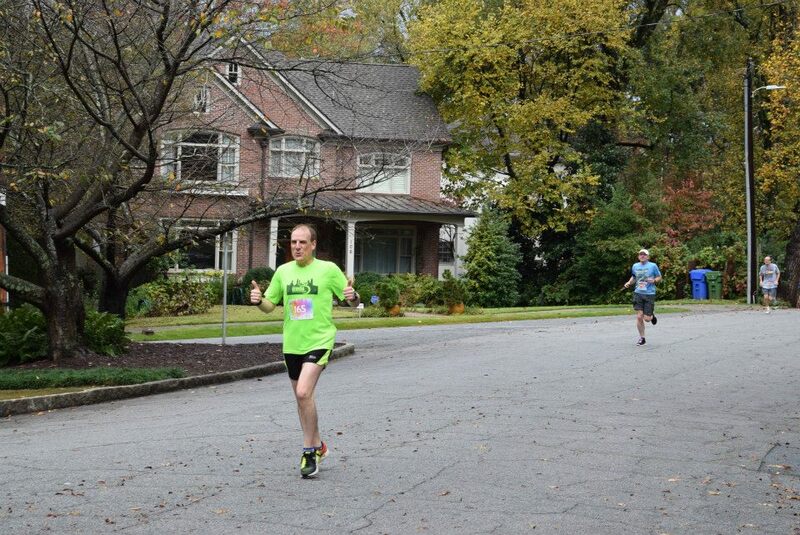 When my running mania began in fall of 2013, the Uptown Rhodes Race was my second 5K. By the time that I ran this race again in 2014 - on a slightly different route - I had run several 10K races and the Atlanta 10-miler, and was registered for my first half-marathon in less than a month. The experience and training definitely showed in a substantial improvement in my time. Since that time, I've plateaued in my speed, while working more on distance and pacing. I didn't sign up for the race ahead of time, as I wasn't previously 100% committed to running this one. As the day for the race approached, the weather forecast was quite ominous for today, with an 80% chance of rain forecast as recently as yesterday morning. In fact I was awakened by an explosive bolt of lightning near the house around 6 am! But when I checked the weather forecast for the next few hours, it was apparent that there would be a window of rain-free weather for a couple of hours coinciding with the 9 am start. 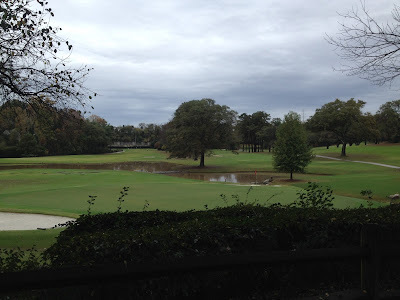 I quickly ate breakfast, dressed in running gear, hopped into the car, and arrived at Rhodes Hall in midtown Atlanta shortly after 8 am, where the organizers were happy to accept my $30 payment in exchange for a race number. I warmed up by jogging about 2-1/2 miles of the route beforehand at a relaxed 10 minute / mile pace, and was glad to have a reminder of several of the hilly sections immediately before running the race. 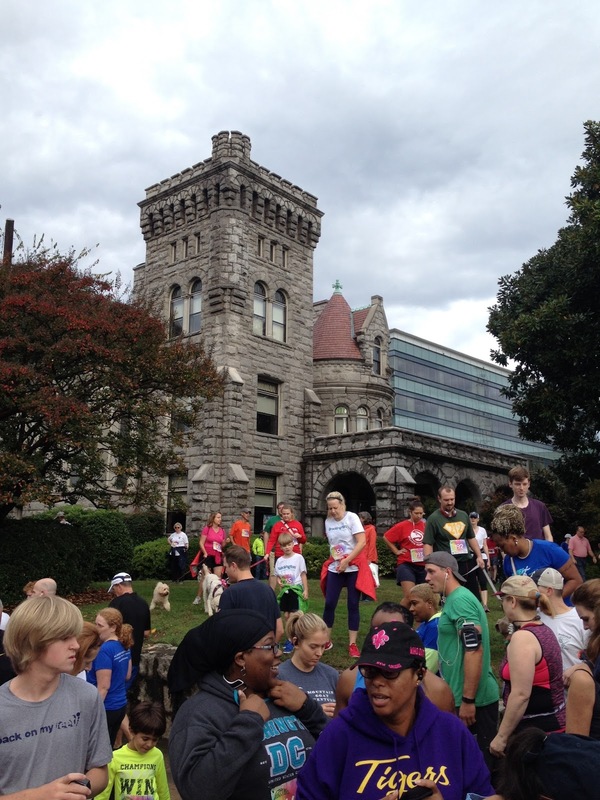 Runners gathering for the start near Rhodes Hall, registered with the Georgia Trust for historic preservation. A modern office building is in the background. As this race didn't use timing chips, we all would get the same start time, so I took a spot about 15 feet behind the starting line. Shortly before 9 am, the organizer raised his hand, a police cruiser blocking Peachtree Street sounded its siren, and we started running! My goal was to start out a little slower than last year on the downhill section, to save energy for the second and third miles that would be mostly uphill. 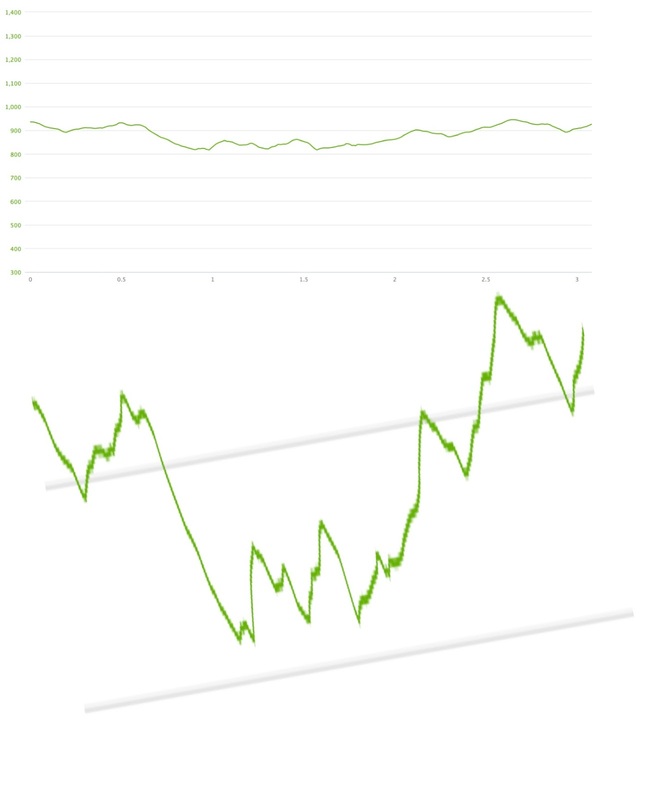 I did manage the discipline to run slower than an 8 minute / mile pace in the beginning, but then picked up some speed in a rather steep downhill section near the end of the first mile. 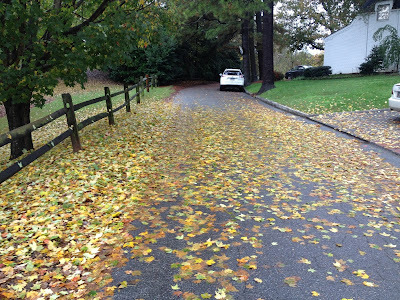 The road felt a little slick with wet leaves on the street, but everyone kept their footing. 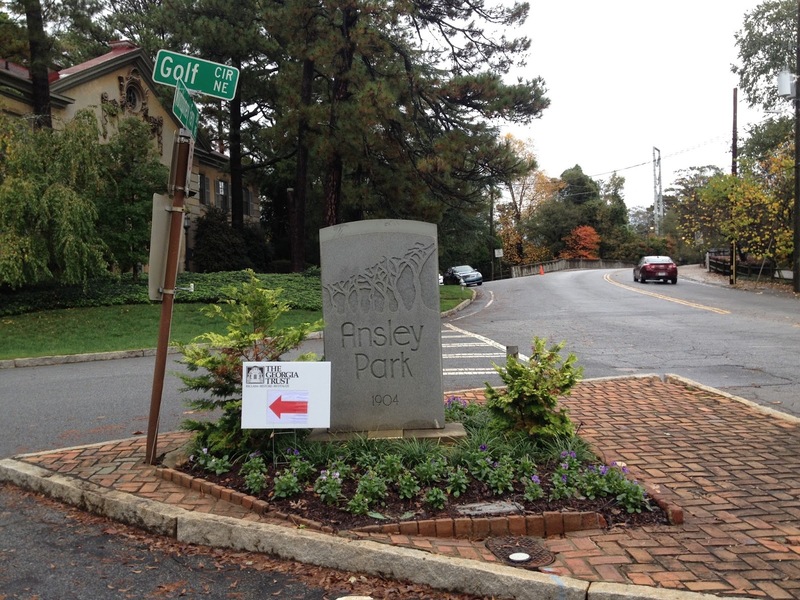 I finished the first mile in 7:43 (net 110 feet downhill). 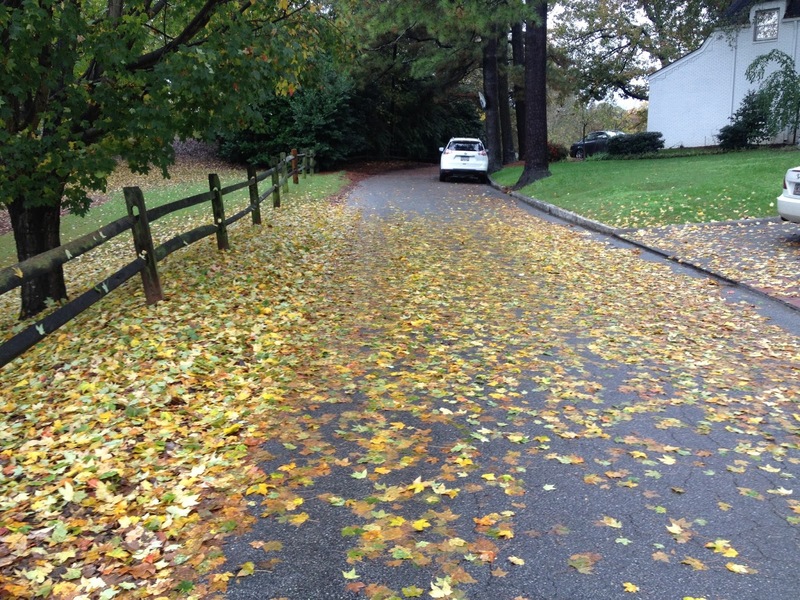 Lots of wet leaves on the streets, but I didn't see anyone fall. 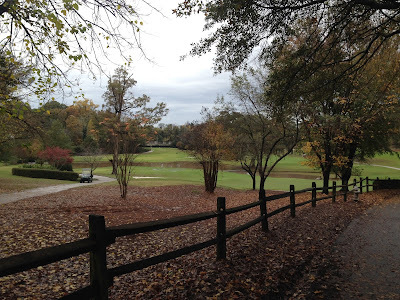 As we passed the Ansley Golf Clubhouse, the road turned uphill, but I managed to keep up a decent pace. I did a good job focusing on technique, pushing off my toes with each step, keeping the turnover of my legs light and fast, and using my arms to propel my body up the hill. This was the best part of the race in terms of the view, looking out over the golf course and enjoying the autumn hues of the trees, which helped to take my mind off of the fact that most of this mile was uphill (net 40 feet, finished mile 2 in 8:29). Just past the 2-mile marker, there was a water stop at the beginning of a rather steep uphill section, so I slowed to a walk to accept a cup of water, and after about 30 seconds resumed chugging uphill. 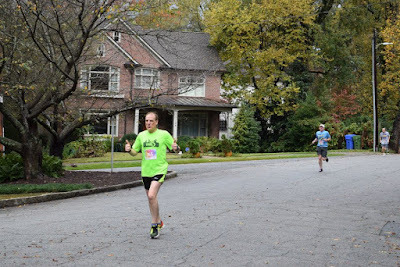 This section of the race is the toughest part every year, but before I knew it, we were making the last turn onto Peachtree Center for the last half-mile to the finish line. I knew that I needed to run fast if I had any chance of breaking last year's mark of 25:06. Fortunately I had enough energy remaining to speed up a bit. Thankfully the road was fairly level in this area (actually my Garmin registered it as gently downhill). The police were having trouble keeping the street completely free of moving vehicles and the runners had to weave a bit on one side or the other of the cones to avoid the occasional resident that was trying to get out of the neighborhood. As the road curved to the left past a traffic circle, I could see the clock at the finish line, showing 24:20, but my initial joy at seeing that I would beat 25 minutes was quickly tempered by the realization that I would have to work hard for it! The finish was gently uphill and the seconds were ticking by much too quickly, but I entered the chute and crossed the finish line at 24:57, exchanging a congratulatory handslap with a volunteer at the end of the line, thrilled to finish in less than 25 minutes! The only disappointment was that the race was a bit short in distance (just as it was last year), registering only 3.06 mi on my Garmin. Nonetheless I was very pleased with my run, especially as the temperature was relatively warm and humid (66 deg F, 88% humidity), and I was happy that I made the last decision to run the race, even though it wasn't a certified 5K distance. The final 1.06 miles were covered in 8:57, 53 feet net uphill. After catching my breath and rehydrating with a bottle of water, I jogged back along the race course to take a few photos of the route. Altogether with the warm-up and cool-down, I got in about 8 miles this morning, including 3 miles of "speed work" in the middle of the run!